Unclaimed property and escheatment is an area that many accounting and financial professionals are unfamiliar with.  The responsibilities of unclaimed property compliance are often transitioned from department to department and from individual to individual. Because of the reasons above, the annual reporting process can be a daunting task. It offers a unique set of challenges that many organizations don’t want to handle on their own. If you’re brand new to unclaimed property or just inherited the responsibilities of unclaimed property compliance, this 20-minute webinar replay is for you. Keane’s Laurie Andrews will detail the fundamentals of unclaimed property, giving you a solid foundation to build upon. What is Expected of Holders? Why Do States Conduct Audits?